A couple of month’s back I presented a 5-level assessment framework based on our book 8-steps to innovation. It depicts characteristics of an organization as it goes from level-1 (Jugaad) to level-5 (Excellence). One question that I got asked on this was, “What are we trying to improve in the first 2-3 levels? And then in the next 2-3 levels?” This article is a response to this question. 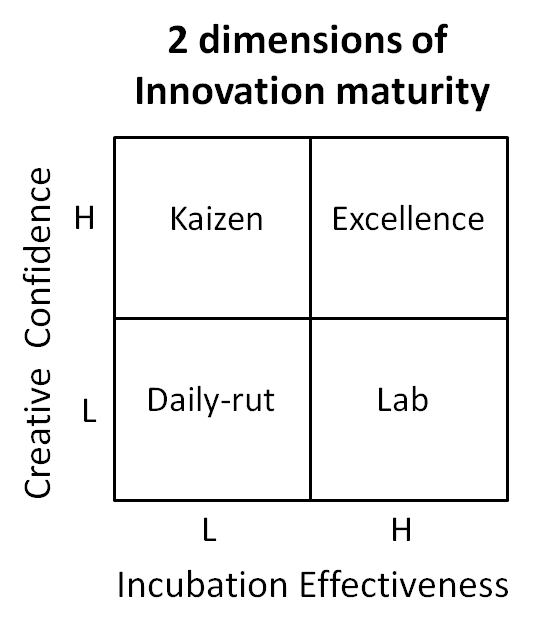 It presents a two dimensional view of innovation maturity – the first dimension being “creative confidence” and the second dimension being the “incubation effectiveness”. I believe it provides a simplified and yet useful view of innovation maturity. Let’s first understand the two parameters and then the sequence of focus. Creative confidence: Creative confidence represents the capacity of the organization to identify and frame problems and create responses (ideas) to the problems. One popular proxy parameter for creative confidence is “idea per person per year” and another one is “participation” typically measured as a percentage of employees giving at least one idea in a year. An ultimate test of the creative confidence is, “Does janitor submit ideas to improve things?” Of course, creative confidence for a senior manager or a Product Architect would involve different type of problems and solutions than that of a fresher. Incubation effectiveness: This parameter measures the effectiveness with which not-so-small ideas get incubated and selectively implemented to create business impact. Organizations create a separate lab to incubate typically large impact ideas. Sometimes an incubation team sits within a business unit and another team sits outside the business unit – under corporate umbrella. A lead indicator for incubation effectiveness is the total value of ideas under incubation and a lag indicator is “percentage of revenue coming from ideas incubated in last 3-5 years”. 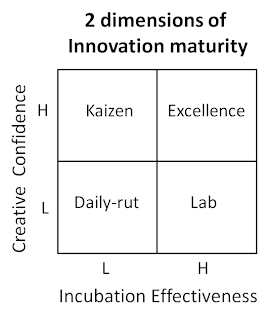 Kaizen vs Lab corner: If you are in the kaizen corner, it means you are generating & implementing lots of small ideas. However, you are doing a poor job of incubating big ideas. If you are in the Lab corner it means you are doing a good job of incubating big ideas but doing a poor job of improving existing products / services. In the Daily-rut corner you are doing neither. Ideally you want to be in the Excellence corner. An innovation journey could begin in any of the two directions. However, I feel that helps to build a critical mass of people (say 30%) confident of innovating. This increases the chance of sustaining the initiative. We have looked at how organizations like Cognizant build creative confidence. In the next few articles I want to explore what it means to run incubation centres effectively.